Balsamic vinegar - This was a gift for Patrick; he loves his specialty balsamic vinegar for salads and we were running low in the pantry before the holidays. We're looking forward to another visit to Blue Sky Oil & Vinegar which is a local store that specializes in artisan oils and vinegar. OXO Good Grips scrub brush - Santa brought this to Patrick because Santa knew our other one was broken and we really enjoy using it to scrub extra dirty dishes. Stainless steel straws - This was a gift for Patrick; they're intended use was to reduce our usage of plastic straws. They're also great for our fruit smoothies. OXO Good Grips zester - Santa brought this to Whitney because Santa knew our other one wasn't zesting quite as well as it used to. We were having a hard time zesting citrus fruits with it and it was needing to be replaced. Pie Crust Bag - This was a gift for Whitney; Patrick knew how much we were enjoying making our own pie crusts but how frustrating rolling out the dough was followed by flour-y clean up. This solved both those problems! We received quite a few other kitchen gifts from family that we've been using and loving! They range from French place mats to silicone suction lids / bowl covers! with sharing this family photo from Christmas! Are you using any fun new gadgets in your kitchen this New Year? Patrick is getting really good at makes crepes! We've enjoyed having them as a brunch option because they come together rather quickly. The batter can be made the night before which reduces prep time. When we have crepes Patrick typically mans the crepe pan while I work on a filling. This particular morning Patrick requested nutella crepes with raspberries. I thought plain nutella would be a little rich so I mixed it into ricotta with a 1:2 ratio of nutella to ricotta. Before rolling up the crepes I spread some raspberry down the filling. Place the flour in a mixing bowl. Add the eggs one at a time, whisking to combine. Add the milk bit by bit and whisk to combine until all the milk is incorporated. Whisk in the extra virgin olive oil and season with salt. Refrigerate overnight. We've got a savory crepe recipe coming up soon too! What's your favorite crepe filling? We made something similar to these flatbread pizzas a year ago. The flatbread is a quick alternative to use in lieu of rolling out crust. These come together very quickly. Now that Patrick has resumed his orchestra rehearsals I need to plan something quick for those evenings where he runs out the door for the evening practices. 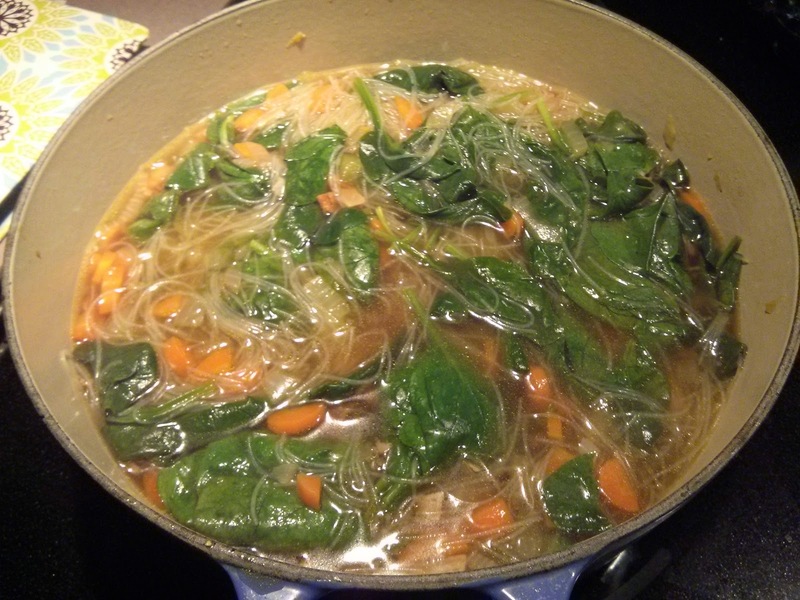 Revisiting this recipe was just what I needed a few weeks ago! This meal fit into the meal plan when we were on Week 1 of our challenge. Week 1 was to include two fruits or veggies with every meal. I'm not really sure how liberal we were allowed to be with counting the veggies. Officially this meal included 5 different veggies - cherry tomatoes, artichokes, onions, red peppers, and spinach. I decided to lump the pizza and toppings as one vegetable (much to Patrick's dismay) and then did the side spinach salad. Toss 1 cup of grape tomatoes with olive oil, salt and pepper, and some balsamic vinegar. Broil until the tomatoes burst. Use an immersion blender to puree the tomatoes and spread over the pitas as sauce. Top with shredded Parmesan and follow with sliced artichokes and sauteed peppers and onions. Follow with Italian seasoning and a bit more Parmesan. Place the flatbread pizzas into a pre-heated 375F oven and warm through until cheese melts. As a "blogger" you might imagine that I read some other blogs. And if you did then you're right! One blog that I follow is the fANNEtastic food blog. 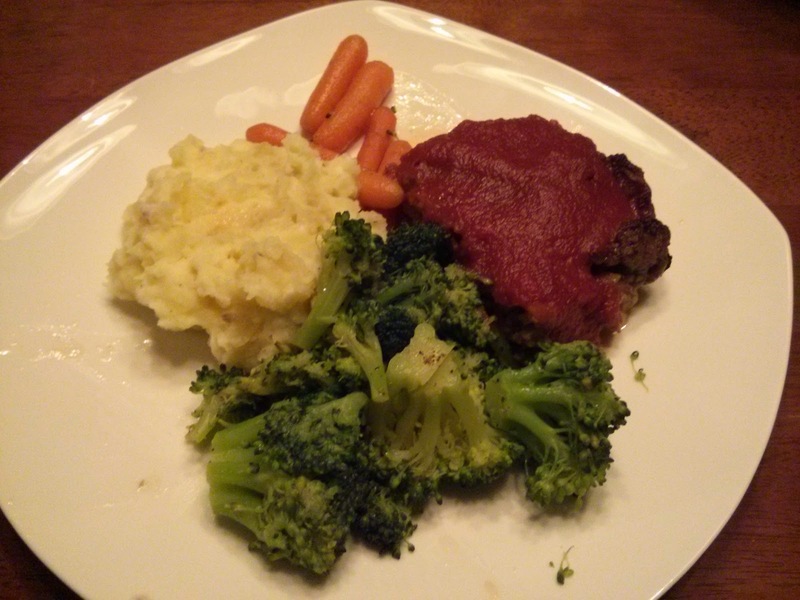 The blog is written by Anne who is a Registered Dietitian that lives in DC. She received her Masters of Public Health in Nutrition from UNC. 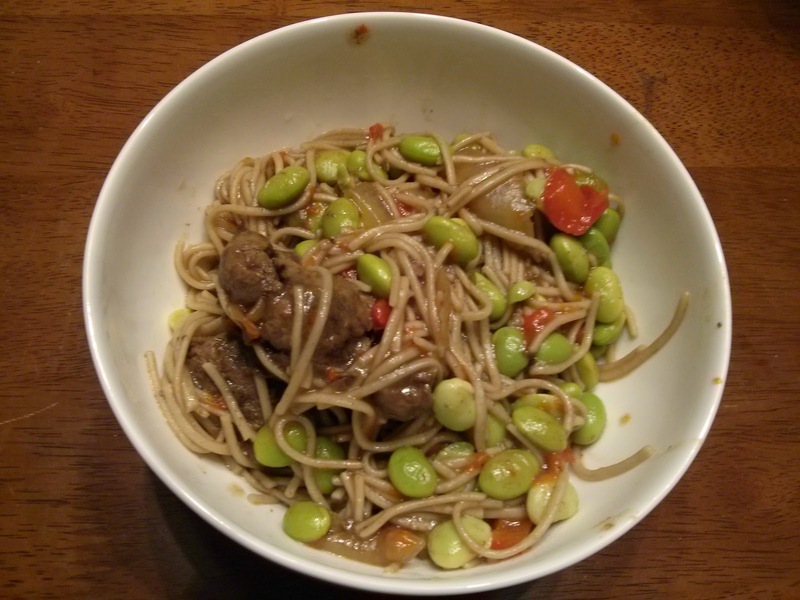 Her blog is a nice mix of rambling about life in DC, exercising, and food awareness as well as sharing some recipes (and other interesting things). Last October she shared a five year anniversary post. I sent this to some of my best friends who live in DC (and also went to UNC) because I thought they might also enjoy following along. I emailed them that particular post because Anne wrote a great summary of the blog and linked back to popular posts. So now I recommend you check it out! Well, much to my delight, one of those best friends then shared a past fANNEtastic food recipe with me. Her husband's boss had recommended it to her and then she did the same to me. It's a great crockpot recipe and really gave Patrick and myself a great flavor profile alternative that we don't usually do in the crockpot. Mix everything together and set to "high" for 4.5 hours. Serve atop a grain and a green (the warmth of the chicken mixture will wilt the greens). 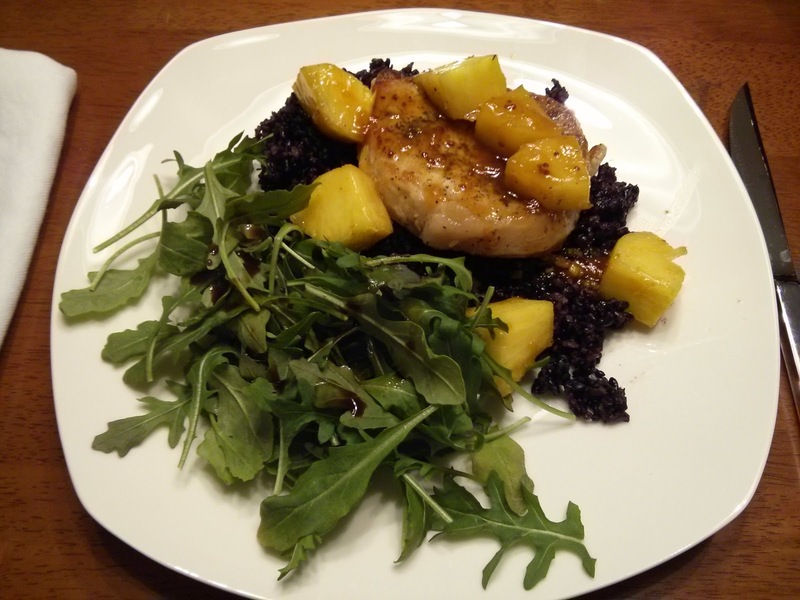 We served with a wild rice blend and arugula. getting our dinners ready so here's a rare kitchen shot. Fun fact - this was our first time using coconut milk! Have you used it before? Last week was fairly "normal" for us - no major plans during the week and then a fun activity for the weekend. I'm quite proud of ourselves for sticking to our meal plan though. There were a few nights where we were starting to cook (somewhat late in the evening) and would realize the designated recipe for the night had quite a bit of prep. I think last week was the most we've actually switched around the meal plan. We may have eaten everything on a different night than was intended. We resisted the urge to do take-out on those nights which means we cooked dinner every night last week. 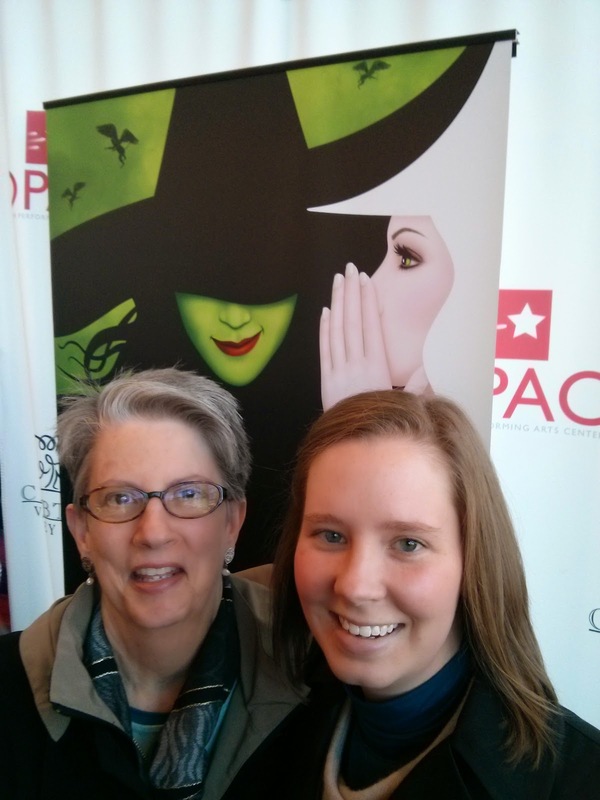 Our reward was seeing Wicked at DPAC with my parents! We enjoyed lunch at Tyler's and then saw the show. Great Saturday afternoon! We continued our food challenge and the focus of week two was beverages. Week 2: Beverages will be limited to coffee, tea, water, and milk (only naturally sweetened with a little honey or 100% pure maple syrup). One cup of juice will be allowed throughout the week, and wine/beer will be allowed in moderation (an average of one drink per day). Week 2 was quite successful! Fortunately we have already instituted most of these lifestyle changes. I no longer buy soda and rarely buy fruit juice anymore. Patrick does occasionally drink sodas on his lunch break so he put that aside for the week. We've both been drinking more water and aiming for 8 cups a day - it's a daily struggle! Up until last fall I always put sugar and milk in my coffee but decided to drop the sugar otherwise that part of the challenge would have affected me. Patrick also had to give up his favorite breakfast drinks - chocolate milk and an occasional Starbucks mocha on his way to work. We were also mindful of our alcohol consumption but we are usually in that recommended amount - an average of one drink per day. The meal plan doesn't reflect any of the food challenge since it was beverages. However you may have noticed that there was some carryover from Week 1 - we have continued to incorporate more fruits and vegetables into our diets. Have you heard of a farmers market on wheels? I'm not sure how popular they are in other regions. I imagine they exist elsewhere. Well the Triangle area has a farmers market on wheels - known as the LoMo Market. They've been operating for about two years and are a great resource for neighborhoods. Here's a blog post write up from a local community blog that features LoMo Market. The post has lots of good pictures of the truck itself. Unfortunately I didn't take any pictures when we visited because the sun had already set. The LoMo Market comes to our neighborhood once a week and I really want to start using them more in the next few months before our CSA starts back. They also have more offerings outside of what our CSA does so maybe I will continue to stop by throughout the spring and summer. We visited this week and purchased eggs from Latta Farms, a loaf of wheat bread from Guglhupf, farmers cheese from Chapel Hill Creamery, and local beets. So much goodness for our taste buds! After we returned from our LoMo Market adventure we decided to have an appetizer with the bread and farmers cheese. I had some apple butter in the fridge to add to it. Delicious! Remember to take advantage of what your community offers in terms of supporting local farms! Since we've been meal planning regularly now we're able to make sure we're adequately rotating proteins and meatless meals throughout the week. I try to incorporate chicken, beef, pork, fish, and a meatless meal in every meal plan if I can. Meatless meals and fish are the two groups that I also put a heavy focus on and may replace beef or pork with those. Chicken is always a great standby for dinner ideas. For this particular meal I had planned salmon and Brussels sprouts. When I got to the store, Brussels sprouts were sold out and the salmon wasn't looking amazing. I quickly changed my game plan and substituted in snapper and asparagus. We rounded out the meal with a wild rice blend. Preheat oven to 425°F. Zest lemon and then cut into 4-6 slices. Place filet on a baking sheet with cooking spray. Top the fish with olive oil, paprika, salt and pepper, and lemon slices. Bake at 425° for 13 minutes or until fish flakes easily when tested with a fork or until desired degree of doneness. We bake until an internal temperature reaches 140F. Meanwhile, combine lemon zest, softened butter, herbs, and breadcrumbs in a small bowl. To serve top fish with the herbed butter. Place fish and lemon slices on individual serving plates; top each fillet with herbed butter, spreading to melt, if desired. Garnish with herb sprigs, if desired. We baked the asparagus alongside the fish in the same oven! Who would've ever "thunk" that one day we'd be raving about beets?! Roasted fresh beets are so delicious. We put them in salads a lot (see here, here, and here), made a soup once, pickled them once too, made a beet pasta, and the most adventurous was a chocolate beet cake! Wait... I got distracted by the beets. Today we're sharing a recipe for pesto mascarpone stuffed chicken breasts which happened to be served aside a spinach salad with beets and goat cheese. Even though we made this a few weeks ago we both commented that it was very typical of a spring dish for us. Beets show up on the CSA list in the early spring as well as lots of tender greens. The pesto in the chicken also added a fresh flavor. All this made us yearn for the warmer weather! Without adding too much more introduction fluff and beet rambling it should be noted that this was a "wing it" recipe so everything below is approximate! Mix together pesto and mascarpone, set aside. Flatten chicken breasts with a meat tenderizer (or whatever gets it flat). Sprinkle both sides with salt and pepper. Spread pesto mixture over flattened chicken breast. Roll each one up and secure with toothpicks. Sprinkle some breadcrumbs over top and drizzle with olive oil. Bake in a 350F oven for 30 minutes (check internal temperature for doneness). Slice and serve. *We froze pesto at the end of the summer in ice cubes. It's been nice to stretch summer flavors throughout the winter months. Passing along a good vegetarian chili to warm your insides during this cold January! Patrick and I made this a few weeks ago; halved the recipe for about 4 servings so we could have dinner and lunch leftovers. *We halved everything! And a few other "ingredients" notes - we substituted in chicken broth for the veggie broth, didn't add the celery, used red pepper instead of green, and used a Mexican blend spice in place of the cumin and chili powder. Add the veggie broth, water, diced tomatoes, and rinsed lentils into a large pot. Bring the mixture to a boil and let it simmer for about 10 minutes (to soften the lentils) while you’re chopping the garlic, carrots, sweet potatoes, celery, and green pepper. Throw the garlic, kale, carrots, and sweet potato into the simmering pot, followed about 5 minutes later by the celery and green pepper and your spices. Let the mixture continue to simmer, stirring frequently, until it reaches the level of cooked consistency you prefer. This shouldn’t take long (maybe 5 to 10 minutes more) — just make sure the carrots, sweet potatoes, and lentils are soft. Enjoy! Serve as is or top with extra marinara sauce, hot sauce, or salsa and cilantro. Patrick topped with salsa and I added some crackers. Last week we mentioned in the meal plan Monday post that we would be starting a 14 week challenge put out by the 100 Days of Real food blog to remove processed foods from our diet. And we had a successful first week of consuming a minimum of two different fruits or vegetables at every meal! Below is a bit more info, how we did, and of course - the meal plan! Week 1: Eat a minimum of two different fruits or vegetables with every breakfast, lunch, and dinner meal. We were mostly successful! I think a few times one of us only had 1 fruit / veg at lunch (seemed to be the hardest one) so we would make up for it with an afternoon snack of fruit. Therefore there were always six fruits or vegetables consumed throughout the day! I found that we were already really good with eating one fruit or vegetable with most meals. While meal planning for this weekly challenge I did have to move things around a bit to make sure we would be meeting the two fruits/vegetables but it wasn't as hard as I thought it would be. Adding a salad and having extra fruit on hand really made meeting the challenge and being successful easy. In this regard so far the challenge for week 1 has been eye-opening. It wasn't hard for us to eat two different fruits or vegetables with most meals (and I thought it would be). So for us to continue this as a lifestyle change I learned that I need to have mixed greens on hand and make sure that the fruit basket stays full! The meal plan below doesn't include every meal despite the challenge. Most of our lunches were leftovers and then breakfast wasn't too far from normal for us. 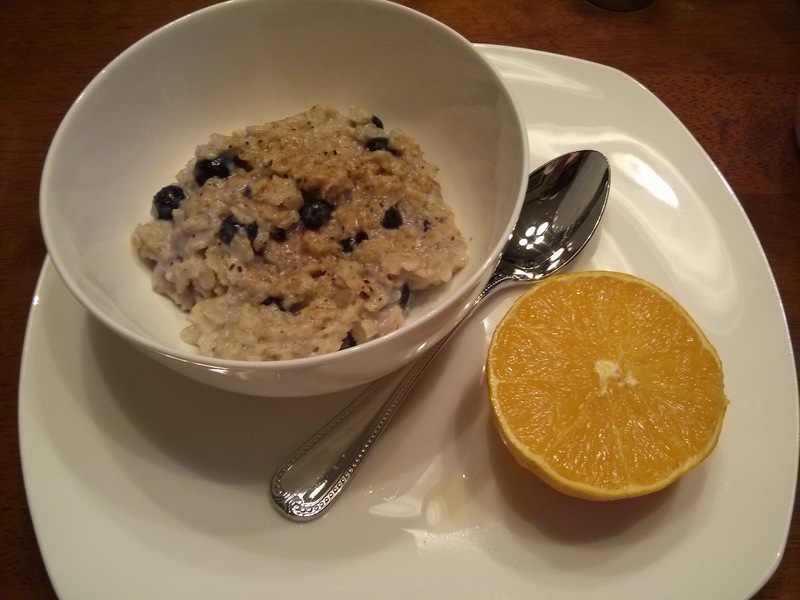 Some breakfasts included a fruit smoothie, eggs with avocado and tomato (also pineapple leftovers from a dinner), oatmeal with blueberries and an orange (pictured below), and also toast with egg, salsa (we were a bit liberal in claiming salsa as a vegetable) with an orange. 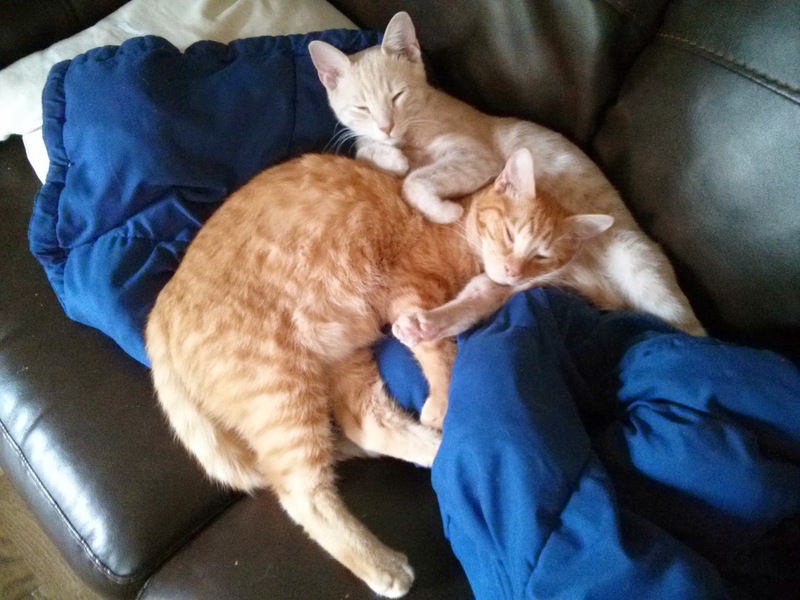 Donate Electronics Waste | Costco | Celebrate a friend's birthday! Patrick and I needed a quick dish over the holidays. We usually turn to pasta for something like that. We can add a protein (like chicken) to the pasta, whatever veggies are around, and then add a simple sauce to it. This dish was inspired from a Chicken Pasta Florentine casserole recipe and so I bought the ingredients beforehand but then we made it our own and made it less casserole. Everything below is somewhat approximate for what we did. Boil water for pasta and cook pasta according to package directions. Slice chicken tenderloins into bite-sized pieces and begin to brown in a large pan with extra virgin olive oil over medium heat. Once chicken has begun to cook and brown, add the onion. Once chicken cooked and onions softened, add sun-dried tomatoes and artichokes. Once warmed through add spinach, cream cheese and cooked pasta. Add reserved pasta water if needed to loosen sauce. Top with Parmesan and serve. I'm not really sure how this meal came about. We made it before the holidays (apologies for the delay) and used some veggies from our CSA - Chinese cabbage for the slaw and turnips for the turnip-potato hash. I used cod for the fish nuggets and made them bite-sized so everything could be layered into a bowl. This turned out really good despite the mess it made in the kitchen. I used the food processor quite a bit for the prep and ended up using all the food processor attachments! Read on to find out how! Shredded 3 potatoes and 2 turnips in the food processor (attachment used: shredding disk). Wrapped them in paper towels to absorb moisture and set aside while prepping fish. When ready to cook, remove paper towel and mix in salt and pepper. Warm oil in large nonstick skillet over medium heat. Add potato and turnips to pan. Let sit for a few minutes to develop browning. Stir and continue the process until evenly browned. Shredded 1/2 head of Chinese cabbage (attachment used: slicing disk). Whisked together 2 tbsp mayonnaise, 1 tbsp rice vinegar, 2 tsp soy sauce, 1/2 tsp wasabi paste (measurements are approximately at most were scoops, dashes, or squirts). Mixed together the cabbage and mayonnaise mixture. Refrigerated until ready to serve. Slice cod (or substitute a firm white fish) into bite-sized pieces. Assemble breading station - one dish with flour, second dish with an egg and beer, and the third dish bread crumbs. To the flour I added some Old Bay. For the egg and beer mixture I used a pilsner and about a 1:1 ratio of egg to beer. For the bread crumbs I toasted some sourdough cocktail bread slices then pulsed them into crumbs in the food processor. Warm oil in large pot. Meanwhile prepare the fish for frying. Pass the fish through the flour, dip in the egg mixture, and then roll through the bread crumbs. Once the oil is hot place fish in the pot. After a few minutes, flip them over. 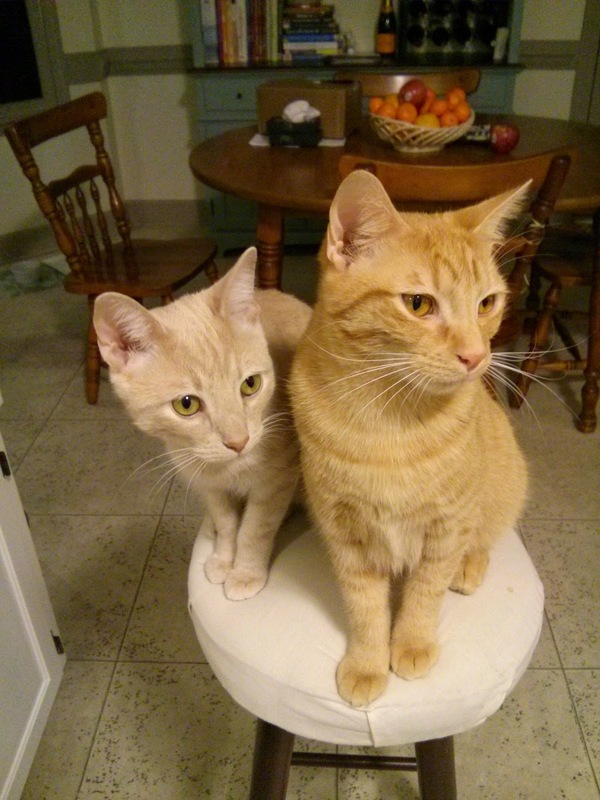 We're getting to the end of sharing our holiday meals - I promise! Aside from the pictures being slightly festive with Christmas dishes and place mats these meals are all hardy options to make throughout the winter. This particular dinner was made when we hosted a local couple that we're friends with. We usually don't entertain with appetizers but I had a busy day and knew that dinner wouldn't be on time so thought we should have something on hand when our guests arrived. summer sausage, pita chips and olive variety. I don't have much of an intro for this dish. It's a great way to incorporate kale into your dinners. This pasta bake doesn't have a long list of ingredients or require you to make a sauce. It's just mixed up cooked pasta, chicken, ricotta, and a few other things. Despite the few ingredients it was quite tasty and we both would recommend it to you! Preheat oven to 350 degrees. In a large pot of boiling salted water, cook pasta according to package instructions. Drain; return to pot. In a large skillet, melt butter over medium-high. Add onion and garlic; cook until onion is beginning to soften, 4 minutes. Add kale, cover, and cook until almost tender, about 5 minutes. Transfer to pot with pasta. Stir in chicken, ricotta, lemon zest, and 1/2 cup Parmesan; season with salt and pepper. Transfer mixture to a 9-by-13-inch baking dish; top with 1/4 cup Parmesan. Bake until top is golden, 30 minutes. Finally things are slowing down a bit from the hectic holidays and we are returning to normal. It's good to be back meal planning and cooking in the kitchen. 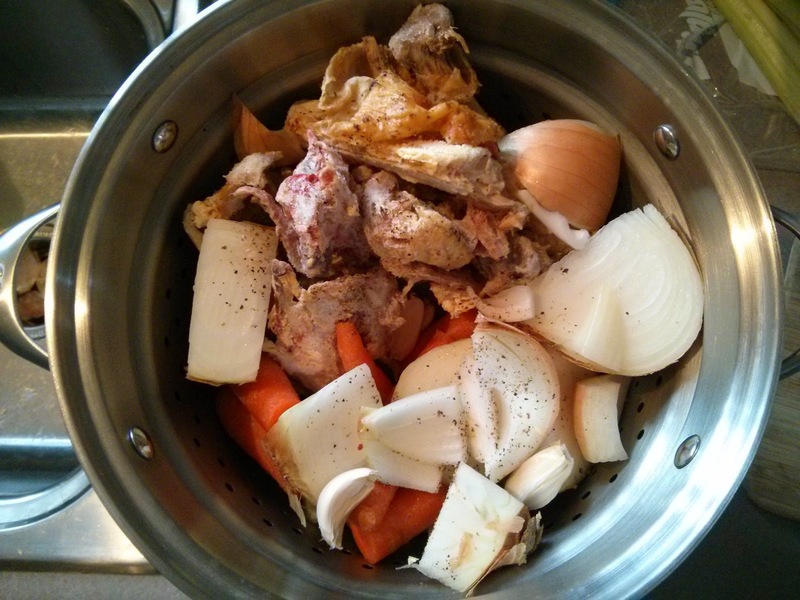 Last weekend we made a pot of chicken stock. To the pot we added a picked over chicken carcass (this was from a rotisserie chicken), quartered whole onion, 3 carrots, 3 celery stalks, garlic cloves, bay leaf, and salt and pepper. Once the stock had simmered for 5-6 hours we let it cool and then put it in individual containers to freeze (variety of 2 cup, 1/2 cup, and 1/4 cup silicone muffin cups that after frozen we place in a ziploc bag). Chicken stock used to be something we always bought in bulk at Costco but we have completely eliminated that purchase by making our own like this and freezing it. Now back to the meal plan! Starting today we are embarking on a 14 week challenge that is aimed at eliminating processed foods from your diet. We'll be following this challenge from the 100 Days of Real Food blog. I'm particularly excited because it also focuses on food sustainability and supporting local farms. Week 1 is to eat a minimum of two different fruits or vegetables (preferably organic) with every breakfast, lunch, and dinner meal. Wish us luck and feel free to join along! Like many folks our age, Whitney and I are craft beer enthusiasts. We enjoy visiting the multiple local breweries, brewpubs, and craft beer stores that have popped up around us in the last several years, and we keep a good rotating selection of old favorites and new beers to try in the fridge. However, all of this craft beer enthusiasm hasn't quite reached every small town in North Carolina, so Whitney decided to bring it to her parents herself with a fun Christmas beer tasting! Whitney went to The Glass Jug, a wonderful local beer store owned by some of her fellow Carolina alumni, and picked out an eclectic selection of six beers. We then prepared some tasting notes, mostly copied from brewery websites and beer style guidelines. The day after Christmas we had a lot of fun tasting and discussing the different varieties and what breweries they came from. Some (all?) of the beers weren't necessarily hits with the parents, but hopefully there was some educational and entertainment value nonetheless. The tasting lineup. Check out the notes to learn more! You may recall from our Christmas week meal plan that we had a brief two day respite at home between family visits. As you can imagine that is not conducive for a trip to the grocery store. We put our best effort into a "throw together" holiday meal and we were pleasantly surprised with the results. We were able to have scallops gratin, wild rice, and green beans. Our Christmas Eve meal was completed by a Biltmore Merlot wine. We've had a bottle of the Biltmore Merlot for the past three years now (first in 2012 and then in 2013) to celebrate the holidays. Preheat the oven to 425F. Pat the scallops dry with a paper towel and remove the muscle. Set aside. To make the topping, use a processor to mix all ingredients except olive oil, breadcrumbs, scallops. After a few pulses begin to add in the olive oil until a spreadable consistency is reached. Finally fold in the breadcrumbs. Place scallops in a broiler-safe dish. Spread the butter mixture evenly over the scallops. Bake for 12-15 minutes, until the topping is golden. The scallops should just be barely done as they will continue to cook. Serve immediately. 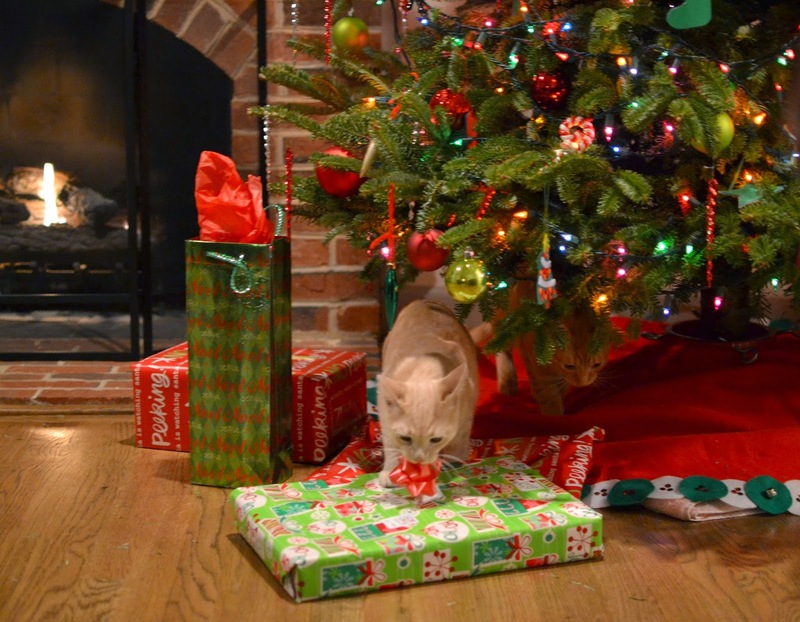 Do you have a bow stealer in your house?? Work has been especially busy this holiday season, so after working the day before Christmas Eve, it was nice to settle down again and relax for a day before traveling again on Christmas Day. Whitney and I made the morning extra-special with some ricotta chocolate chip pancakes! Like you, the first time we had these I figured they would be crazy weird disgusting, but instead they tasted like normal moist delicious pancakes. I think I prefer them to the buttermilk recipe we tried here. We were out of maple syrup, so the chocolate chips added in some sweetness, and all together they were very good. Set ricotta in a fine mesh strainer about 30 minutes before you start cooking, to drain off excess liquid. Whisk together flour, baking powder, sugar, and salt in a bowl. Combine ricotta, milk, egg yolks, and vanilla in a separate bowl. Beat the egg whites in an electric mixer until stiff. Add the dry ingredients to the ricotta and milk mixture, stirring gently until just combined. Whisk in a small amount of the egg whites to lighten the batter, then fold in the remaining whites and chocolate chips. Heat a griddle over medium-high heat, and brush the surface with butter. Use a ladle or measuring scoop (we used a 1/3 cup measure) to pour batter onto the griddle. Cook pancakes for about 3 or 4 minutes, then flip, cooking until both sides are golden brown. 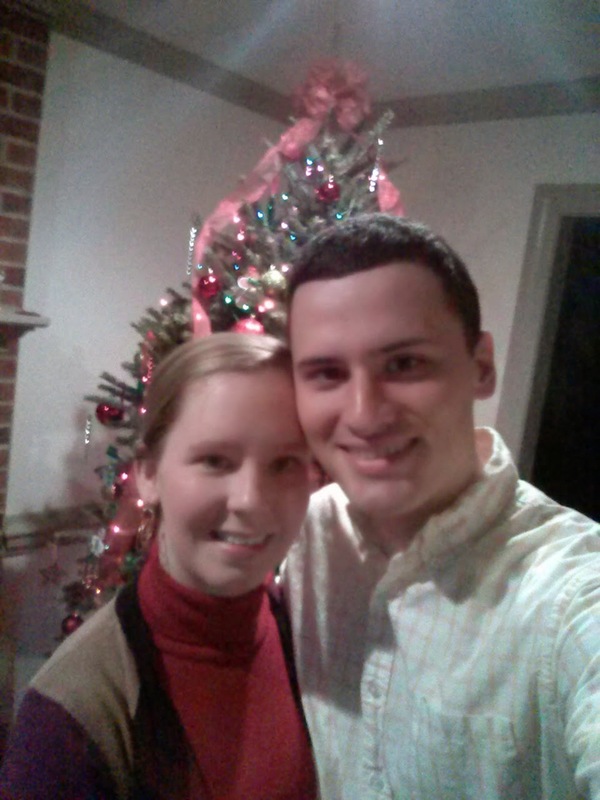 In the middle of December Patrick and I got together with our neighbors for some holiday merriment. We all decided that it would be fun to plan a progressive dinner (I'm on a secret mission to bring back progressives and make them cool again). Since there were three couples it worked out perfectly to have appetizers at one house, dinner at another, and then dessert at the last house. 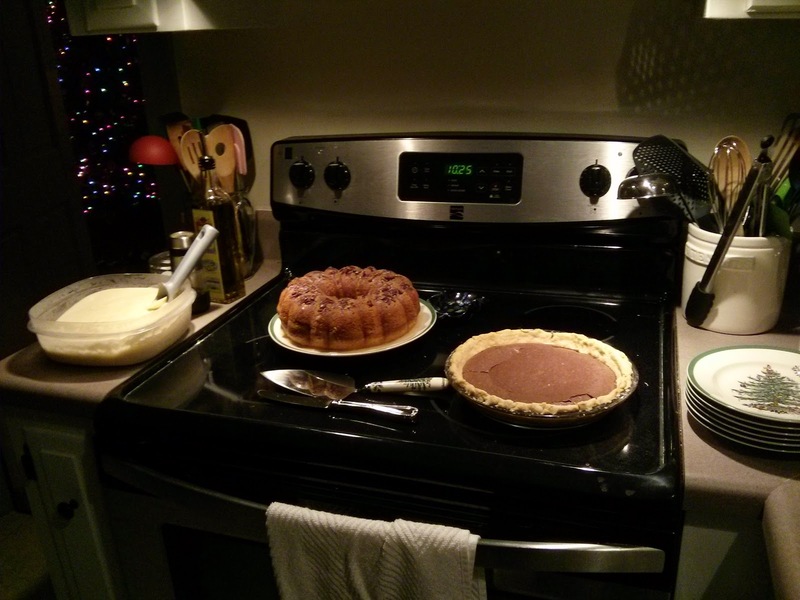 We volunteered for dessert and served a rum cake with eggnog ice cream and chocolate pie. Patrick and I feel extremely lucky to have moved into such a great neighborhood with amazing neighbors! This progressive was a great way to celebrate that! Melt butter and chocolate. Mix with other ingredients which have been blended together. Pour into pie crust. Bake 35 minutes, at 350F. Preheat oven to 325F. Grease and flour 10 inch tube or 12 cup bundt pan. Sprinkle nuts over bottom of pan. Mix all cake ingredients together. Pour batter over nuts in pan. Bake one hour. Set on rack to cool. Invert on serving plate. Prick top. Drizzle and brush glaze evenly over top and sides. For glaze, melt butter in saucepan. Stir in water and sugar. Boil 5 minutes, stirring constantly. Stir in rum. Optional: Decorate with border of sugar frosting or whipped cream. Serve with seedless green grapes dusted with powdered sugar and whole maraschino cherries. Mix eggnog, heavy cream, condensed milk, and vanilla in a large bowl. Pour the mixture into an ice cream maker and freeze according to manufacturer's directions until it reaches "soft-serve" consistency. Transfer ice cream to a one- or two-quart lidded plastic container; cover surface with plastic wrap and seal. For best results, ice cream should ripen in the freezer for at least 2 hours or overnight. Couldn't resist taking a selfie before we left to start the progressive! Each house was wonderfully decorated and the food we ate that night was delicious. We capped off the night with a "Yankee Elephant" gift swap. This was such a nice evening to share with neighbors and we look forward to making it an annual event! Wow! Our crazy holiday schedule did not let up last week. When we returned from family Christmas visits we went into party planning mode. One of Patrick's friends from college got married on Friday! Even though they are located in Chicago now, Jake and Natalie decided to tie the knot in Chapel Hill. We co-hosted a New Year's Eve party in their honor. It was an exciting week! Thursday thru Saturday - Wedding activities; Jake & Natalie get married! No Hoppin' Johns this year for us - hope we'll still have good luck throughout 2015! 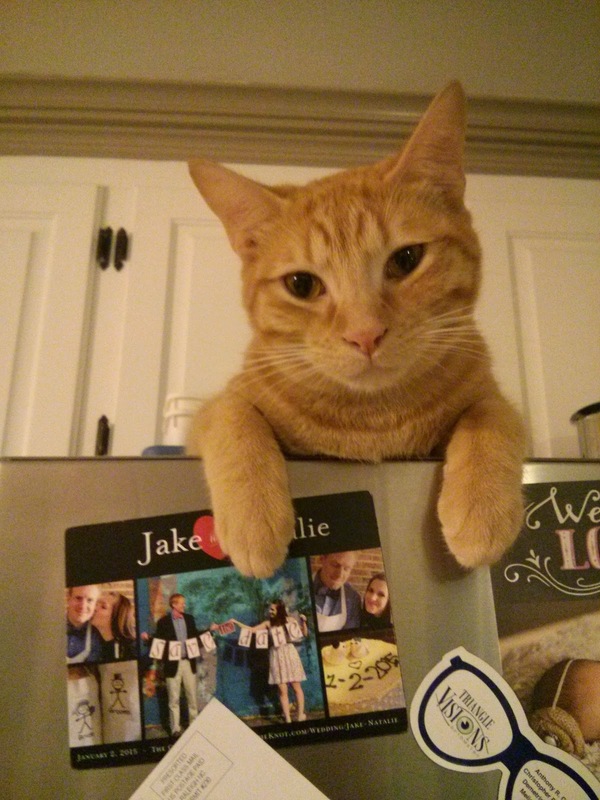 Nacho pointing out Jake & Natalie's "Save the Date"
to make sure we didn't forget the wedding! This week we'll be doing our best to wrap up Christmas themed posts! Not a fan of green smoothies?? Well this is a great way to start your day [and New Year] with kale without putting it in the blender. This frittata is packed with kale and red peppers; the eggs are a great source of protein as well. This is also a nice option to change up your egg preparation. Heat oven to 350 degrees. In a small ovenproof skillet, heat oil over medium heat. Add onion and pepper and cook, stirring, until softened, about 5-7 minutes. Add kale and cook until wilted. Season with salt and pepper. Meanwhile whisk eggs and cream together. Pour eggs over vegetables and transfer skillet to oven. Bake until eggs are cooked through and set, about 10 minutes. Flip it over onto a cutting board to slice and serve. Serves 4; we split the frittata into quarters and two leftover for breakfast the following morning. May your New Year be filled with peace, love, and happiness. We brought in the New Year by co-hosting a celebratory party in honor of one of Patrick's best college friends and his fiance who are getting married this week! It meant a lot to us that we could throw them a party and kick off their wedding fun! 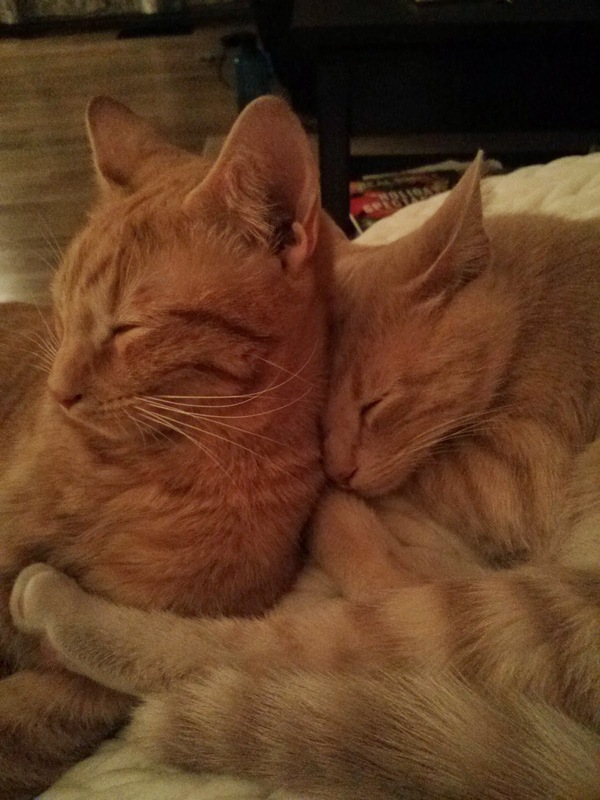 We look forward to sharing more recipes (and cat pictures) with you this year! 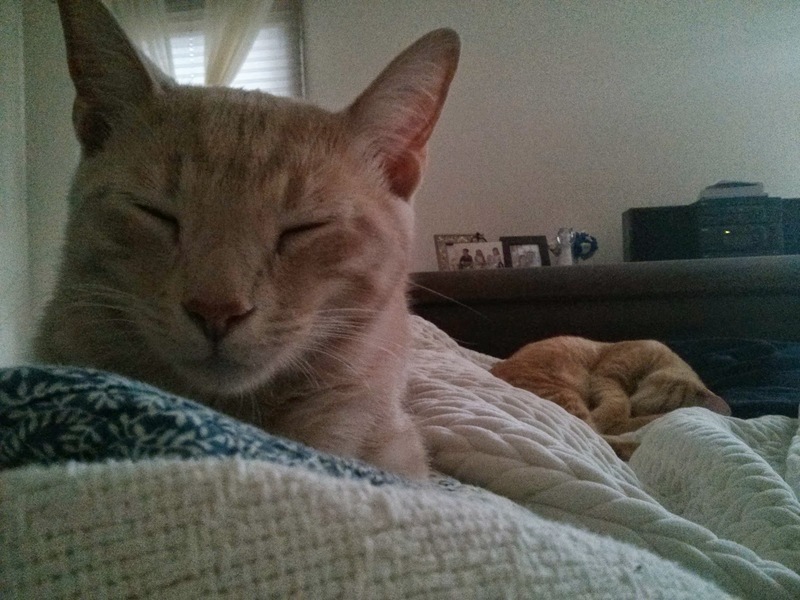 Dupree and Nacho starting 2015 with a cat nap.